This is our most popular tour. On this tour you are picked up at your hotel or other convenient location while you sit back and relax aboard a luxury motor-coach or van as you are guided along the East Rim of Grand Canyon National Park onto the Navajo Indian Reservation, and the Painted Desert while in route to the base of Glen Canyon Dam where you will board motorized 15-22 passenger river rafts for your 15.5 river mile smooth water ( no rapids ) river adventure. Stopping 2 hours into your tour to see ancient Petroglyphs ( Indian Graffiti) on the side of the Canyon Walls. Then you have lunch on a beach and continue until you arrive at historic Lee's Ferry. Next you will relax and enjoy the views as you are in route back to your hotel in Grand Canyon aboard a luxury motor-coach or van. This gentle rafting experience is unforgettable! Perfect for all ages 4 years and up. Prices include all fees and fuel surcharges. For more information on Grand Canyon see our visitor information pack. You will be notified with your confirmation number if your request is available . 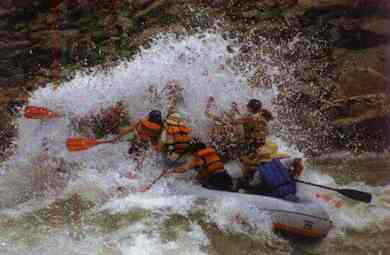 Our white water rafting trips offer the most exciting trips you can find in the Grand Canyon. With trips lasting from 1 day to 21 days. 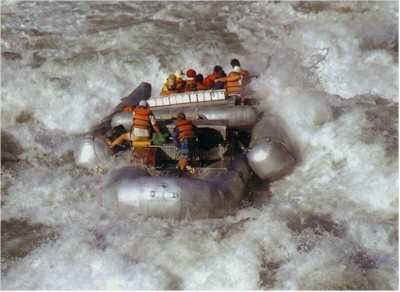 One day white water rafting trips are by far the most exciting and most memorable way to visit the Grand Canyon. On the one day trips you combine the excitement of white water rafting, short hiking trips into side canyons, and a view of the Grand Canyon's majestic cliffs that only can be seen from the river. The one day trip travels about 55 miles on the river, and goes through 9 sets of rapids. With two number 7's, and three number 5's, and the rest are number 3's and 4's, you will need to bring rain gear or a change of clothes because you will get wet. On the one day trips you will be flown from the Grand Canyon airport by airplane to the pickup point where you will be transported to the river. You will be on the river around 55 miles. After you go through the 9 sets of rapids, the side canyon hiking trip to Travertine Falls, enjoy a river side lunch (included), and just floating down the mighty Colorado River, you will be taken by helicopter from the bottom of the Canyon back to where you board the plane for your trip back to the Grand Canyon airport. Your day begins at 6:15 am check in at the Grand Canyon Airport and returns back at Grand Canyon Airport around 6:00 pm. Please bring tennis shoes or sandals, because they will get wet, a wide brim hat, sun lotion, water proof camera (disposable), change of clothes or rain gear, and get ready for lots of quality family time memories. Children 9 years and up welcome.